When possible, it is useful to challenge the shooter. Playing a higher ‘line’, not too deep within the D, the goalkeeper is able to challenge the angles and cut off visible shooting space against their attacking opponent. Whilst it takes confidence and trust in your shot stopping abilities and reaction times, being aggressive with your positioning will effectively make it harder for you to be scored on as the shooter looks to shoot around or through you in order to score. By standing further out, the goalkeeper is able to cut down the angle and shooting space. By tentatively waiting on your goal line, you are making it more difficult for yourself, so instead of ‘sitting back’ and making it easier for the shooter, work at stepping out and proactively challenging. Instead of trying to make the save behind you (which is very hard) or directly to the sides of you, you should look to attack the ball to improve your save making. There can be a tendency from nerves or fear of the ball (thanks to poor equipment or lacking in confidence in it or personal ability) not to challenge shots and to stay deep in the D, with a ‘line’ that is very close to the goal line. Against a packed D this is more of a necessity, with a smaller ‘D within the D’ making lateral movement easier, but when faced with an obvious shooting opportunity from distance, it is good to get more control of the situation through challenging the angles. Staying on your line gives the shooter too much space to choose from on the play. Challenging the angles is the concept of stepping off the goal line to cut space; the idea of moving up the triangle of the established angle to reduce the shooting space available to the shooter. Setting up the angles and cutting the down, by moving out to challenge, is most important when charging a penalty corner, or when the shot is coming so fast at you: you can’t just rely on reflexes, but have to read and react, diving, or moving across, putting a bigger wall in front of the shot. Angles give you the starting point of the save, cutting them down makes them easier, so you still need to move yourself across in some way to make the save, otherwise you’ll have given away an easy scoring chance. However, just because you’ve cut down the space for a shot, it doesn’t mean you don’t have to make the save (i.e. by passively blocking); you’re reacting to where the shot’s going, not where you think it’s going. You’re already on the angle, but now you have to respond, by putting a pad, kicker or glove on it, or putting your body in front of the shot. It all depends on the type of shot you face. By challenging off your line, you can dramatically reduce the shooting options. 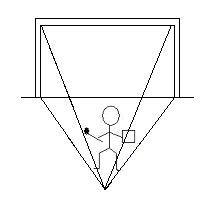 One of, if not, the most important skill of angle play by the goalkeeper is narrowing the player’s shooting angle to make it harder for them to score; bringing the goalkeeper closer to the shot, to make the save easier, whilst taking away valuable shooting space at the same time. 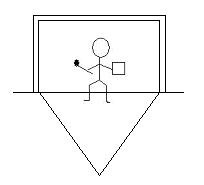 As the attacker comes in to for the shot the goalkeeper steps out onto the angle, getting in position to cover the shooting space, thus reducing the shooter’s options. By challenging the shooter, you make it harder for them; having to take time to choose the shot, by which time you are ready and waiting. Playing big is used in conjunction with angle play to cut down shooting space. Looking ‘big’ is the result of playing the angles and challenging them. By stepping further up the angle and off a deeper line, you create more of an imposing figure. By ‘playing big’ you can impose yourself on the shooter, making the goal look smaller as you appear bigger; playing with a wider stance will cover more of the net, whereas standing tight and rigid will make you appear easy to score on. Playing big is making use of playing the angles; it’s reducing the space the shooter has to shoot. And it depends on the style you play (if you play a reactionary style, you’re more likely to have your hands nearer your body), but again it’s using the techniques we have to our advantage. Like goalies in soccer who come further out, with their stance wider apart and their hands far out to the side, ready for the shot, we are very similar, with our legs apart to move more easily, and hands mid-height. Before you go about challenge a shot, you need to be at the centre of the angle so you know whether to cover the near or far side of you, and to ensure you are not ‘off the angle’, but ‘on’ it instead, for your chances of making the save. Being central to the shot in your positioning, in that you are centred on the ball, so that you are not too far over to one side, is essential to challenging angles effectively. By being aware of your positioning, it makes it easier to step off your line and move forward to challenge the angles more effectively. You can’t successfully challenge the angles with aggressive positioning, if you are not centred, as you will give away too much shooting space to one side! A good example of attacking depth and centred positioning. Obviously, there is a problem with being too far forward. By being at the top of your triangle on the angle, it is obviously very easy to pass the ball around you, or score around you, in a backdoor pass scenario. If you are challenging very high on a corner, then you don’t give yourself ample time to react, as you will see the ball but not be able to get a glove on it quickly enough (well, if playing at the highest levels!). You need to find a balance that suits; a philosophical ‘middle way’, able to challenge and react to the shot or play at the same time. Potentially, you want to be a few steps off the goal line, able to step forward when a direct shot becomes obvious, where it is suitable to challenge. Cortes is a great example of this and is a good example to learn from. Sometimes, however, it is not possible to challenge shots so aggressively. Faced with a packed D, or where there is a need to face scrambles, then you are going to be playing deeper, making use of a deeper ‘line’ within the D. Obviously there is not much point wondering around the D past the p-spot, because of leaving a gaping space to shoot into and because lateral movement would be difficult, but when it is possible, stepping further out allows you to challenge a shot and make use of angles to make a more controlled and theoretically easier save. Instead, be aware when to challenge as such and do so well! Penalty corners are another good opportunity to make use of aggressive depth, other than facing clear scoring chances from the top of the circle. If the goalkeeper is not expecting a slip pass or deflection involved routine, then they can step out of the goal and step forward into the D, high, to challenge a flick or shot. By being closer to it, they can challenge it more suitably. The following save illustrates the ability to still react athletically even if challenging , increasing the chances of making the save by making it easier so you don’t have to be at full stretch! It takes a bit of confidence in your ability to stop shots and read the play, but ideally, the goalkeeper should challenge on every shot and every opportunity. This obviously depends on personal preference, style and ability to get around the goal, but when the opportunity to challenge a clear shot arises, then the goalkeeper would hopefully step out to aggressively challenge to make the save. By being more aggressive with your positioning, you make it harder for the shooters to score on you as you give them less room to shoot into, and combined with an attacking technique, increases your chances of save making!